Confirming the motto chosen on the day of his priestly ordination “Credidimus caritati” (“We have believed in love” – 1 John 4:16), Msgr. 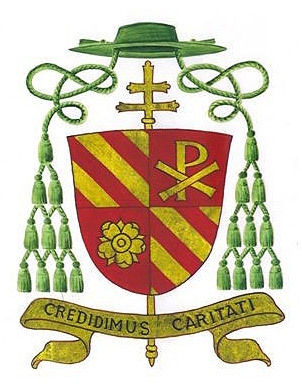 Bonazzi wanted to express in his ecclesiastical Coat of Arms, the great truths of the faith that have nourished his Christian and Priestly life and which he also intends to place as the foundation of his Episcopal ministry: the mystery of God’s love, One and Triune, fully revealed and communicated to mankind in Jesus Christ, the Word of God made flesh and the Redeemer of man, the mystery received and announced by the Church and of whom the Virgin Mary is the Mother, the Model, and the most exquisite fruit. The green prelatial galero is surrounded on either side by ten tassels and surmounted by a two-barred Cross (symbol of the Archiepiscopal Order). The shield in the form of a chalice is divided into four quadrants. In the first and the fourth, three golden bands (crossbars) symbolize the Most Holy Trinity whose providential love – giving life and direction – radiates all of creation (indicated by the red background which is the color of love of which, so to speak, all of creation is imbued). In the second dominant quadrant, also gold (indicated by the letters X and P of the Greek alphabet), the monogram of Christ who, by his Incarnation, Death, Resurrection and his Ascension into heaven reveals and shares with us the mystery of God – Love – Trinity. In the third quadrant, the Rose symbolizes the Virgin Mary, both Mother of Jesus and Mother of each Christian (she is venerated in the Litany of the Blessed Virgin Mary under the title Rosa Mystica) that the Church gathers together in unity (like the petals on the rose) men and women of every nation, race, people and language. The red background recalls the “fire of love” of the Holy Spirit who guided the Virgin Mary and guides the Church as well as every person who listens to the Holy Spirit.